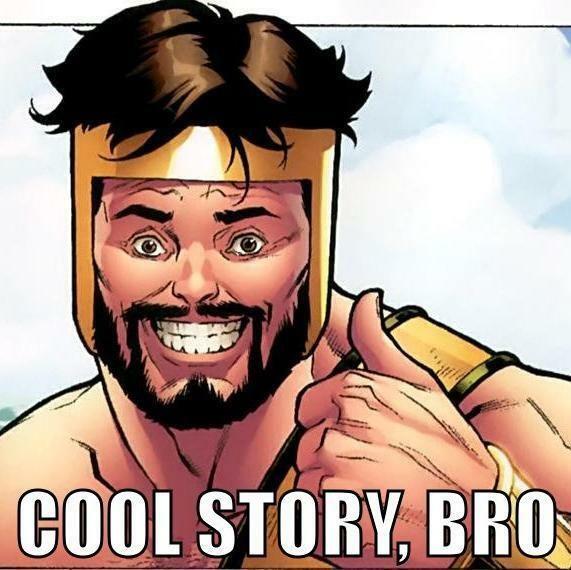 The word “kudos” comes from ancient Greece and means “glory.” And even though there is an S at the end of the word, kudos is not a plural. 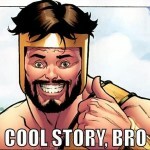 Cool story, bro… but what does kudos have to do with PINT and web development? I went straight to the source for the above definition because, despite an English degree and more books than I have shelf space for at home, I was clueless as to the origin of the word. 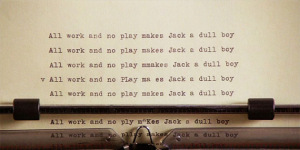 In fact, my earliest childhood memory of it was as the name of a pseudo-healthy snack weakly offered up as a substitute for a Snickers, which I guess fooled a few people until they started adding M&Ms to the mix. But the reason we’re talking about kudos on the PINT blog has to do with employee recognition. On a monthly basis, we here at PINT take time to recognize all the ways our team members help each other out. While praise from the company leadership is invaluable, it’s important for any organization to encourage colleagues to congratulate and reward each other. 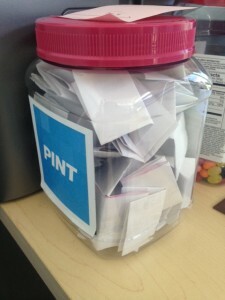 PINT’s method is the awarding and circulating of Kudos, by which co-workers make it rain (in a workplace-appropriate fashion) little slips of paper over each others’ desks. On the slips they jot thanks, practice sketches and create sticker collages. These small gestures are meant remind teammates that their collaboration and support is appreciated. At the end of the month, all the slips go in a jar, and the lucky one that’s plucked wins the bearer a little gift. With only 12 drawings per year, there are many who do not “win” kudos. But there’s a last chance kudos! At our end-of-year holiday bash, the annual accumulation goes into another drawing for a Grand Prize. This past year, it taken home this year by a fortunate Client Services Manager (congrats, Ashwini). If you are a member of a caring organization, this program likely sounds familiar. Most sizable companies have some form of Employee Recognition Program in place, though format and participation vary. There are Employee Recognition modules built into HR Management software, standalone SaaS products and the like; some have tangible rewards and some assume the recognition to be the reward. 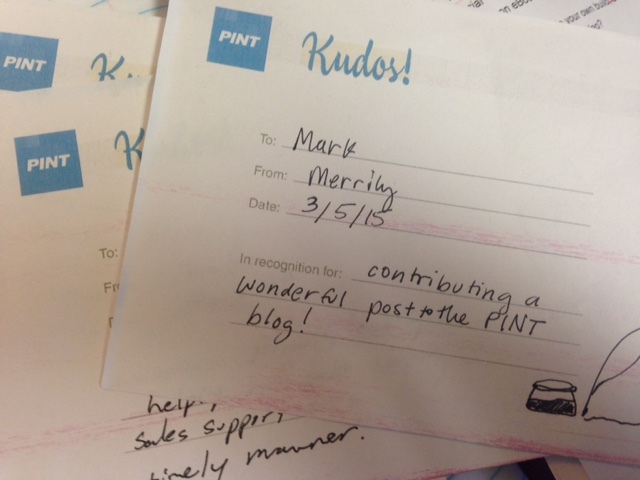 At PINT, a small gift reward is the preferred recognition, with some added email and chat publicity. It’s important to note that regardless of the reward, the significance and success of an Employee Recognition Program is founded on the nominative aspect of the recognition. This type of program should encourage peers to recognize each other for great work, supplementing praise from leads or managers. While respect and recognition from above is always important, nomination and recognition of good work by peers and co-workers fosters teams that are motivated by that invaluable and elusive quality: camaraderie. 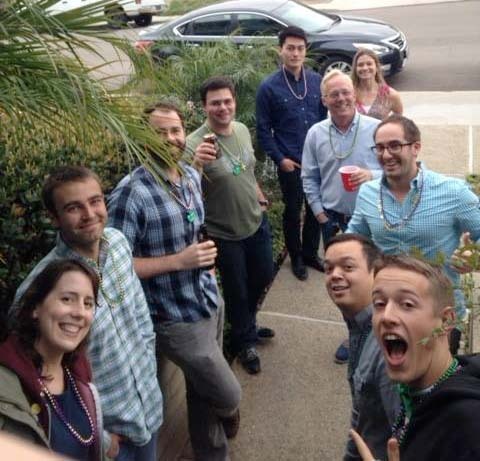 Of course, our Kudos Employee Recognition Program is just one small way PINT practices active team-building. Rooftop cookouts, holiday events and other shenanigans (as seen below) contribute to the general esprit de corps. We like to think we’ve got a comfortable, supportive workplace where our team can develop as people and as professionals. How do you recognize and thank? What employee recognition programs– formal or informal– have taken hold in your organization? We’d love to know, so tell us in the comments section below.